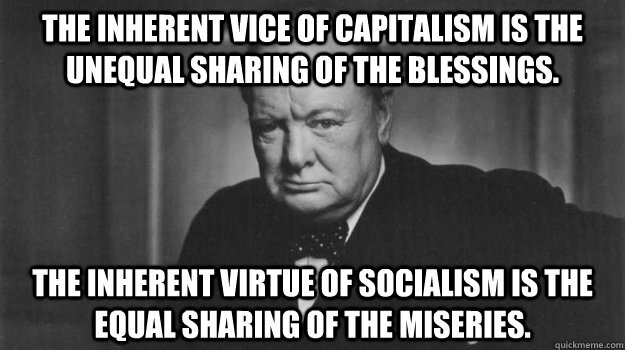 Last week, I offered the view that adopting socialism is a recipe for disaster. Most of the political “-isms” (socialism, communism, fascism, imperialism, etc.) “-chies” and “-cracies” (monarchy, anarchy, theocracy, democracy, plutocracy, oligarchy, etc.) sound different on paper, but they all have two things in common: the rule of one human or few humans over the rest, and the absence of individual freedom. There is an alternative. Our founders gave us a Constitutional republic which enshrined the rule of law and individual liberty. The essential element of freedom is property rights, including self-ownership. The political-economic system that arises where freedom reigns is called capitalism. It has never been fully embraced by any country. Our own country perhaps came the closest, which greatly contributed to the vast economic achievements and ever-increasing prosperity we came to expect as Americans. Yet our failure to fully adopt it has had a profound effect on our history. The institution of slavery was a direct affront to the concept of freedom, and it convulsed our country from its beginnings through the Civil War and beyond. I’ve written elsewhere of slavery and unjust war as two of the four major dysfunctions that have afflicted our country. Want some examples of how capitalism is better than socialism? The Ukraine is a geographic bread basket, similar in productive potential to the US Midwest; yet the Union of Soviet Socialist Republics (of which Ukraine was once one of the socialist republics) had to import grain from us during the height of the cold war. Why couldn’t they produce and distribute enough to feed themselves? Virtually every labor saving and communications device and other technological advancement since the Dark Ages was invented or perfected in the US or another semi-capitalistic country. (E.g. the electric light bulb, the car, the airplane, the microwave oven, the TV, VCR, and DVD, the laser, vaccines, etc.). Have you ever considered buying a car designed and manufactured by an Iranian or North Korean company? Does such a thing even exist? Why aren’t such things invented in dictatorships and socialist utopias? In most cases, landlocked nations are doomed to economic mediocrity or worse. (Examples: Afghanistan, Mongolia, and Bolivia). But a few, such as Switzerland and Lichtenstein, are incredibly well off. What separates them? The ones that are well off have a much higher degree of individual freedom and capitalism than the others. China was once every bit the communist leviathan that the Soviet Union was. Why didn’t China go the same way the USSR did? Conversely, why is the US going through a decline? China is ascending to the same degree it has adopted limited capitalistic market reforms. Our country is declining to the same degree we adopt the socialist dysfunctions that destroyed the Soviets and continues to hamper the Chinese. Imagine the productive energy that could be unleashed if 1.4 billion people enjoyed a fully free existence! Despite the vast body of historical evidence that capitalism works and socialism doesn’t, capitalism has been given a bad name. Individual freedom requires individual responsibility for one’s own actions and living with the consequences of one’s choices. For that reason, capitalism will always be a hard sell compared to the free goodies and cradle-to-grave care promised by the heralds of the other “-isms.” On top of that, where capitalism has some influence, prosperity follows. Prosperous people are easy for envy-baiters to blame in order to gain an audience…and power. In virtually every human system of organization other than capitalism, anyone with wealth could only attain it by taking a bigger share of “the pie” than everyone else. Capitalism is unprecedented – it allows the productive to enlarge the pie! But the envy mongers can’t or won’t see that. They say capitalism fosters greed. There’s no denying that greedy people exist, and some of them advance quite far under semi-capitalistic economies, but socialism is absolutely powered by greed and envy! It is easy for the prophets of utopia to blame capitalism for the sins of the other systems. The latest example is the appellation “crony” capitalism. The proper term for companies using influence, connections, and campaign donations to get laws passed that stifle their competition is “corporatism.” Using the coercive power of government to stifle your competition when you can’t win competitively through offering better value is not capitalism at all, though it has some capitalistic trappings (namely the privately-owned nature of the corporation). The really ironic thing about the other “-isms?” They need the productivity of capitalism. A greedy socialist can’t “redistribute” wealth from the productive to the parasitic if there isn’t any wealth to start with. He must decry capitalism even as he robs the capitalistic in order to buy votes from those he has bamboozled. This entry was posted in Economics, History, Politics & Philosophy and tagged capitalism, crony capitalism, dysfunction, dysfunctional government, Founders, Freedom, government, socialism, wealth redistribution. Bookmark the permalink. ← Socialism Seems Free, but You WILL Pay for it!